Since we’re in the middle of fall, we’re still making lots of fall recipes at home, one of them being my niece’s favorite, caramel apples. We’re both been making these apples for several years now and each October we make a date to make them at my house. Now that I think about it, I’m not sure why these apples are so popular during the fall, I’m thinking it has to do with the fact that apple picking season starts in September here in the US and everybody tries to make all kinds of apple recipes during the season. The easiest way to make the caramel for this recipe is by melting a big bag of caramels in the microwave or on the stove top over medium heat. It’s less complicated, faster and way more practical than making it from scratch. You can also use whatever kind of apples you want, some people love using Granny Smith (green) apples, which are a bit sour, because they love that contrast of flavor with the sweet caramel. 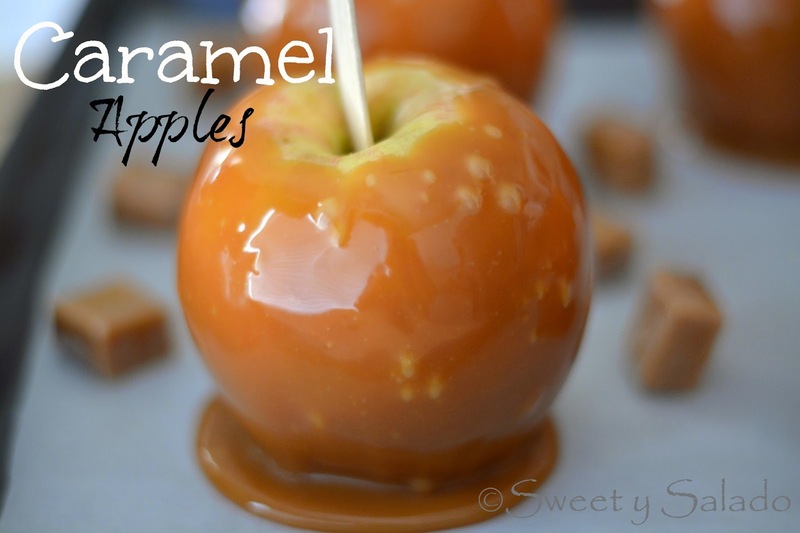 I prefer to use Gala apples because they’re a bit sweet and go really well with the caramel. 1. Wash each apple with hot water to remove the wax and dry well. Remove the stems and place them in the freezer for about 15 minutes. This will help the caramel adhere to the apples. 2. Cover a cookie sheet with parchment paper. Grease the parchment paper with butter so the caramel apples don’t stick to it. 3. Unwrap each caramel and place them all in a medium bowl (microwave safe). Add the milk and microwave for 1 minute. Stir well with a spoon and microwave again for another minute. Stir again until you get a smooth caramel. 4. Take the apples out of the freezer and dry them well, if needed. 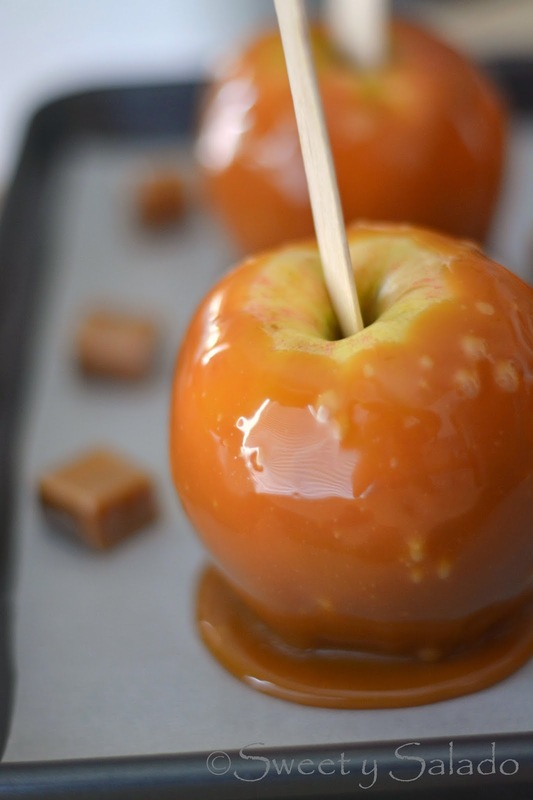 Insert a craft/wooden stick into the top of each apple and dip each one in the caramel by holding it from the craft stick, try to cover it completely. Let the caramel drip off as much as possible, then, scrape off the excess from the bottom with a knife and place each apple on the greased parchment paper. Continue this process with every apple. If the caramel starts to harden, you can microwave it for another 20-30 seconds until it softens. 5. Once all the apples have been covered, place them in the refrigerator for about 15-20 minutes so the the caramel can firmly set. ** Note: You can melt the caramels on the stove top in a medium pot over medium heat.